The Stewardship Foundation is a Columbus-based public foundation founded to give charities, advisors and individuals the opportunity for “transformational giving” investment opportunities, namely those that respect human life, protect religious freedom, and support traditional marriage between one man and one woman. They needed a website, logo redesign, and email marketing program. They also wanted to offer advisors free access to Crescendo’s planning tools. They wanted to communicate their commitment to the “call to Christian Conscience” on which their investments are based and provide biblical sources for their mission. Our solution was a soft, beautifully designed website that immediately immerses the visitor in a slideshow depicting their niche market, counterbalanced with an icon from their new logo and their touchstone bible quotation. Other bible quotations are spread throughout the site and rotate via an active database. The rotation gives search engines constantly updated content which, over time, can elevate the site’s URL higher in search engine results. Each of the three audiences — donors, charities, advisors — quickly find their message space from the home page through the use of brightly headlined portals. A prominent Give Now button on the home page leads to custom designed form where donors can choose which type of cause they wish to support. 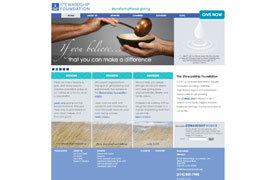 Other work we’ve done for The Stewardship Foundation, Inc.